Where the fires of hell burn so hot, you can literally cook steaks on the sidewalk. 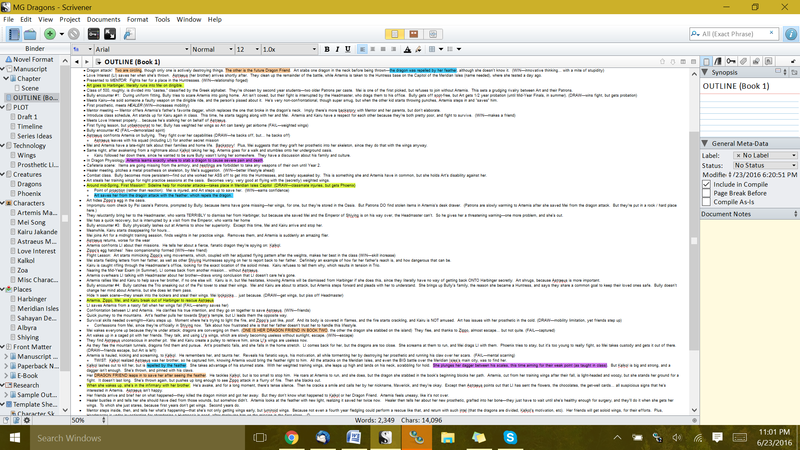 This week’s topic is what I’ve been frantically trying to finish: the outline for Wings of War, my newest project. That’s because Camp NaNo starts on July 1st, and I need to be prepared to hit the ground running. I’ve spent a month world-building. Now it’s time to get the story on paper. Well, I tried James Patterson’s paragraph technique. It worked for Operation Overload, but wow, this time it was useless to me. It was SO much info; 2000 words into the document, I was only 1/4 of the way through the novel. Yikes. That’s not my style. I have to assume this is me improving my plotting ability. I was happy to pants for years. It’s only lately that I’m trying to find an outlining style that works for me. So change here is good! I’m happy to try new things. Using Fandelyon’s story structure, I decided to broach a scene list instead. Here’s my step-by-step approach. Plot big events. These are scenes that dramatically decide where your story goes. Try for 3 major events first: the inciting incident, the halfway point, and the Point of No Return. Fill in other scenes you’ve been thinking about. Some of these may be more character development than actual plot. Start from the beginning. Work through the story logically–how does your character get from Point A to Point C? What happens at Point B? Slowly add more detail. Flesh out vague scenes, but don’t add more than a sentence or two of explanation. Focus some time on the ending. Make sure you know exactly what’s happening where and when. This shows you exactly what you need to foreshadow earlier on: weapons your MC will need, skills she’ll acquire, friends she’ll make. Enemies she’ll make. All of this needs to arrive long before the Final Battle. Move backwards from the ending to foreshadow these points. You should have a pretty comprehensive story by now. Take some time away from your outline. Share it with your betas, and play video games while they edit. Ask them to look for gaping plot holes, things that would require an entire rewrite of your novel, since that’s the point of outlining at all, right? I relied heavily on the Better Novel Project to flesh out tropes and themes within my novel, and that wound up being a great prompt. Whenever I’d get stuck, I’d read another one of her insightful articles. It would always remind me of something else to add. My outline is around 2000 words again, but this time it’s done! And with short descriptions for scenes, it was easy to follow plot progression and make sure everything was evenly distributed for a smooth story! Side note: Another option here is handwriting literal scene cards. 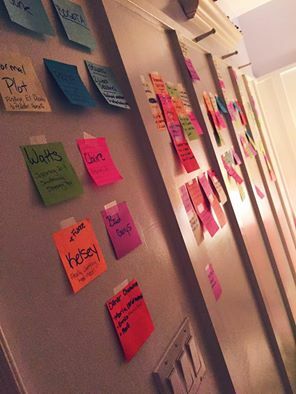 Having physical notecards to rearrange might help you tackle problems in your novels. Easy way to see if one area gets too much attention, too, especially if they’re color coded! After today, I feel like this is my Point of No Return. I’ve been testing the waters before now, but every novel I write from this point on will be plotted, not pantsed. Which is crazy–I never, ever thought I’d say that! I’m a little sad, but also… kind of relieved. I just have to hope that one day, I’ll find an outlining method so thorough I won’t need to start a book over from scratch ever again. Very helpful! I’ve been reading the Better Novel Project articles and trying to use them to help me plot my July Camp NaNo project (obviously I’m behind schedule…) but I like your higher level approach to getting the big stuff laid out. Speaking from experience with my mystery novel, you’re absolutely right that knowing the ending in advance is really important!